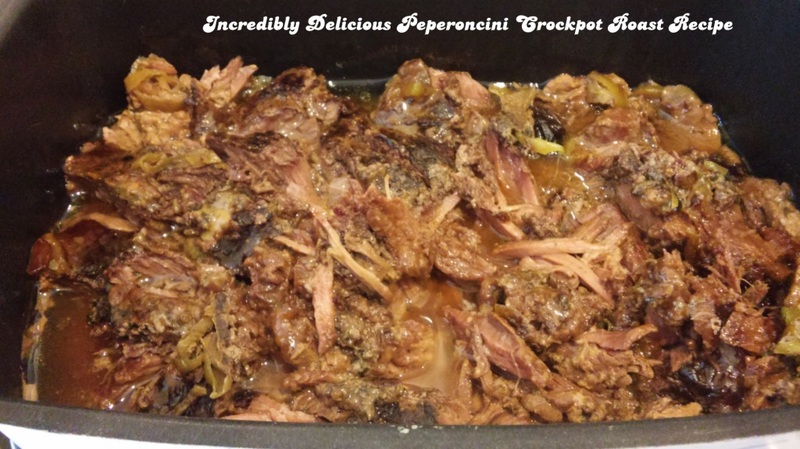 This crockpot roast recipe is so incredibly delicious that I’ve been making it weekly for the past several weeks without getting tired of it. I can throw it together in the morning in just a few minutes and have a scrumptious dinner waiting for me by evening. You should be able to find jarred peperoncini somewhere around the pickle section of your grocery store. Peperoncini are a mild type of pepper with slight heat, commonly used on deli sandwiches and subs. They’re also great in green salads with feta cheese, tomatoes and balsamic dressing. Don’t be put off by this if you don’t like peppers. The peperoncini add tasty seasoning to the beef and gravy, but you’ll hardly know they are there when you eat it. Add ¼ cup of water into the slow cooker, then place the roast on top. Sprinkle the dry ranch seasoning mix on top of the roast, then sprinkle the dry gravy mix on top. Add the butter, and finally pepperoncini around the roast. Shred the meat and mix it with its gravy, then serve by itself or with noodles, rice or crusty bread.